Last week, The Takeout’s Gwen Ihnat reviewed Red Lobster’s Cheddar Bay Biscuit Mix, which she called “nothing short of revelatory” for home cooks replicating Red Lobster’s iconic dish. Good God. The thought of Cheddar Bay Biscuit as fried chicken batter curled my toes so tightly it shattered 26 bones in each foot. I immediately bought a box of biscuit mix from my local grocer ($2.99 at this particular store), a packet of chicken wings, and began experimenting. I played through different scenarios. One involved treating the biscuit mix as a wet batter, but I figured by the time the chicken cooked through the exterior would’ve been burnt. I toyed with par-frying the chicken pieces, remove from hot oil, then dredge in wet batter and finish frying—but that seemed unnecessarily messy. The approach I ultimately chose was the most reliable dredging method for deep-frying: dry-wet-dry. I divided the biscuit mix into two bowls—one with just the flour, the other with shredded sharp cheddar cheese added. I added the garlic herb butter with 1/4 cup of melted butter (not included), and divided that too into two bowls. This became my dredging station. I lightly seasoned chicken wings with salt and pepper. The wings were coated with biscuit flour from the first bowl, then into the garlic herbed butter, finally to the second bowl of biscuit flour with cheddar cheese. I fried these battered wings in canola oil at 350 degrees for six minutes. I didn’t have much hope for the cheddar cheese to survive the fry. As expected, the cheese melted into the oily abyss. But the fry coating was lovely—light and crisp, a subtle buttermilk tang and creaminess. By far, the dominant flavor was of garlic butter, worth the price of admission. It didn’t fulfill the lofty promise of a cheddar biscuit batter, but it tasted a bit like ranch dressing was fried right into the wings, then finished with a brushstroke of rich, hot butter. 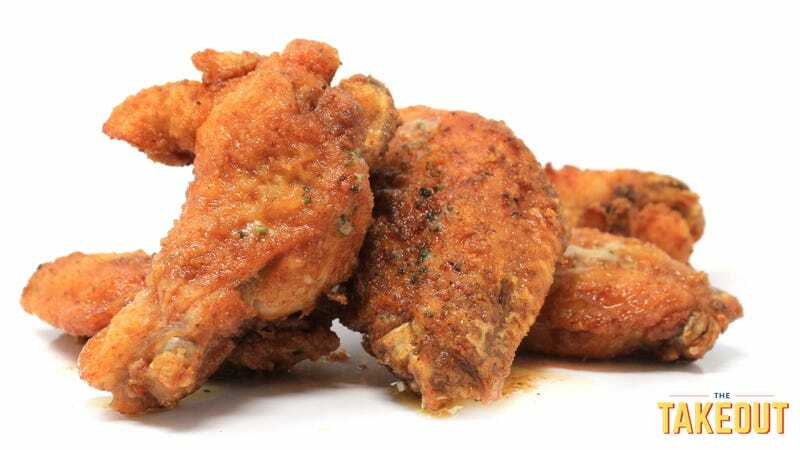 It’s everything appealing about eating crab legs but in fried chicken wing form.